MOST people use the number of goals in a game as a barometer of the entertainment they have witnessed. It’s a benchmark that usually works – even the most error-strewn game can seem acceptable if the nets have bulged a few times during the 90 minutes. 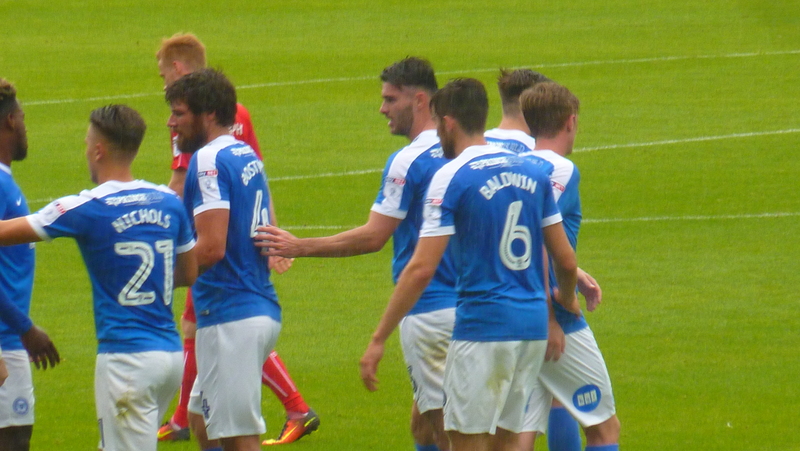 The game between Peterborough United and Swindon had four goals, but not many people will have left London Road feeling they had been royally entertained. It was largely a dull affair, lacking in passion and the ground, with just 4,500 people watching, seemed strangely subdued. London Road is currently known as the ABAX Stadium, renamed after the Norwegian company that signed a five-year sponsorship deal with the club. It’s always seemed like a sizeable stadium, although the capacity is now 15,000. Peterborough has a notable cathedral and a population of around 200,000. According to that beacon of reason, The Daily Mail, the city was taken over by Poles around a decade ago, but the talk on the train arriving at Peterborough station was the recent problems with “travellers”. There were clearly no worries about Swindon Town fans arriving in town for the early kick-off with the “Posh”. In some towns, an influx of away fans causes an over-reaction from the local constabulary and a slight air of tension around local pubs, but there was no sign of that in Peterborough. In fact, it was very low key even half an hour before kick-off. Peterborough are at their lowest ebb for around a decade. They’ve had three years in the Championship during that time, but were relegated in 2013. Since then, they’ve finished sixth, ninth and last season, 13th – a worrying trajectory. Attendances at London Road fell by 12.5% last season to an average of around 5,500 – when they were relegated they were attracting more than 8,000. Former Northern Ireland international Grant McCann was appointed manager of Peterborough in the summer. He hadn’t had a bad start to the 2016-17 season, with Posh winning three and losing two of their five games before the Swindon fixture. With a new manager came a lot of activity on the player front, with 11 new faces arriving and an equivalent number leaving the club. Peterborough started the season with a win at Rochdale and subsequent victories came against Millwall (5-1 at home) and at MK Dons, a 2-0 success that lifted them to seventh in the League One table. Before meeting Swindon, they had been beaten 1-6 at home by Norwich City in the Checkatrade Trophy in front of 1,700 people. Swindon Town’s season so far had been characterised by a lack of goals, just four in four games, but they had lost once and were knocked out of the Football League Cup on penalties against Queens Park Rangers. There didn’t seem to be much of an away following at London Road, but the 12.15 start may have had something to do with that. 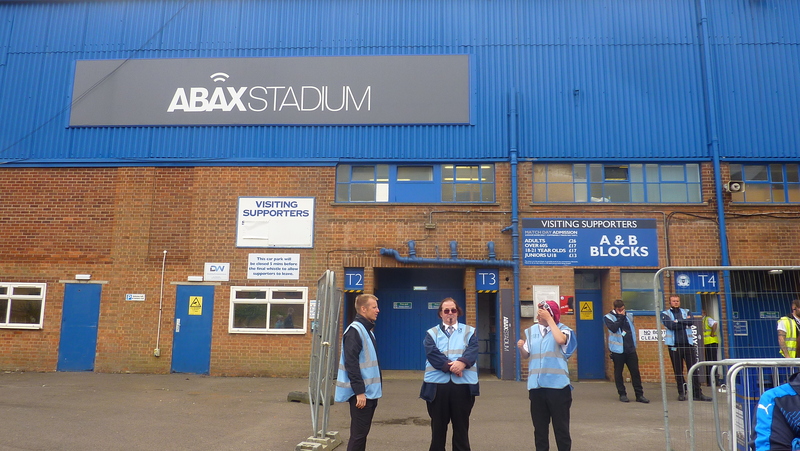 That may have also explained the relatively muted atmosphere at the ground – there was no time for a pre-match bevvy to help lubricate the vocal chords! Pre-match on the pitch was dominated by a platoon of mascots, seemingly one for each major sponsor. There was the traditional “posh” gentleman (and woman), a top-hatted, booted and suited chap striding among his people. And then there was Peter Burrow, a gormless rabbit with large carrot accessory. I was reassured to see that Peterborough have not been tempted to discard their long-time mascot. The malaise extended to the team in the first half. Swindon looked the more energetic side and but for over-elaboration they might have taken the lead on a few occasions. But it was Peterborough that went ahead on 36 minutes thanks to a superb free kick from impressive midfielder Marcus Maddison. He floated the ball in and Gwion Edwards, one of the summer arrivals (from Crawley Town), headed home in off the woodwork. It was Peterborough’s first chance of the game of note. Swindon equalised from the penalty spot on 51 minutes, Michael Doughty netting after Michael Bostwick had rather unluckily handled in the area. A penalty restored Peterborough’s lead after 63 minutes, Maddison stroking home with his left foot following a dubious decision from the referee who failed to see that Chris Forrester had made a meal of a challenge from a defender. Justice was done, however, with 12 minutes to go, although it was harsh on Jack Baldwin, who turned the ball into his own net from Doughty. Two goals and a point apiece was probably a fair outcome. One other player that caught the eye was George Moncur, who joined the club on loan before the transfer deadline. Moncur was lively and skilful and will certainly add a different dimension to Peterborough’s attack. One wonders what he might have done if he had played for 90 minutes. We might have seen a very different game. For those that like old-fashioned football grounds close to the town centre, Peterborough is a classic “old school” venue. But there have been rumours of a new development at various times and given London Road’s location, the Posh’s future is more likely to be away from their current site. It makes you wonder how some of the clubs in our region actually survive league football. Compare the attendance at this league one game of just 4,500 with the 8,097 who came through the gates yesterday at league two side Luton Town and most no doubt would have felt they got value for money seeing the home side beat Wycombe Wanderers 4-1, not to mention the added bonus of them going to the top of league two as a result. Then just down the road you have Stevenage FC who for the past two seasons have generally recorded gates of between 2,500 and 4,000, only stretching into double figures for local derbies and the notable exception of mouth watering cup ties. Well done to Stevenage incidentally on recording their biggest ever win over Hartlepool of 6-1 yesterday. Whilst Luton Town have always had a much bigger fan base than a lot of other clubs locally it’s still a credit to them that they regularly draw in double the numbers that clubs like Peterborough and Stevenage don’t come anywhere close to getting. Previous Entry Wilshere-on-Sea: Relapse or renaissance?